On 1 April, Hideyuki Takatsu was appointed Deputy Director-General of the Fusion Research and Development Directorates within the Japanese Atomic Energy Agency (JAEA). In this capacity, he will be responsible for all ITER-related activities within the Japanese Domestic Agency (JA DA) based in Naka. Hideyuki Takatsu is a familiar face in the ITER community and in the fusion research community in general. After earning a degree in nuclear and mechanical engineering from Osaka University and a PhD in mechanical engineering from the Tokyo Institute of Technology, he joined the Japanese Atomic Energy Research Institute (JAERI). Over time, he became responsible for the design of JT-60 Tokamak, its R&D, and the fabrication of the vacuum vessel, its plasma-facing components, and mechanical support structures. He participated in the assembly of the JT-60 at the Naka site, as well as in testing and commissioning and the initial operation and experiment phases. 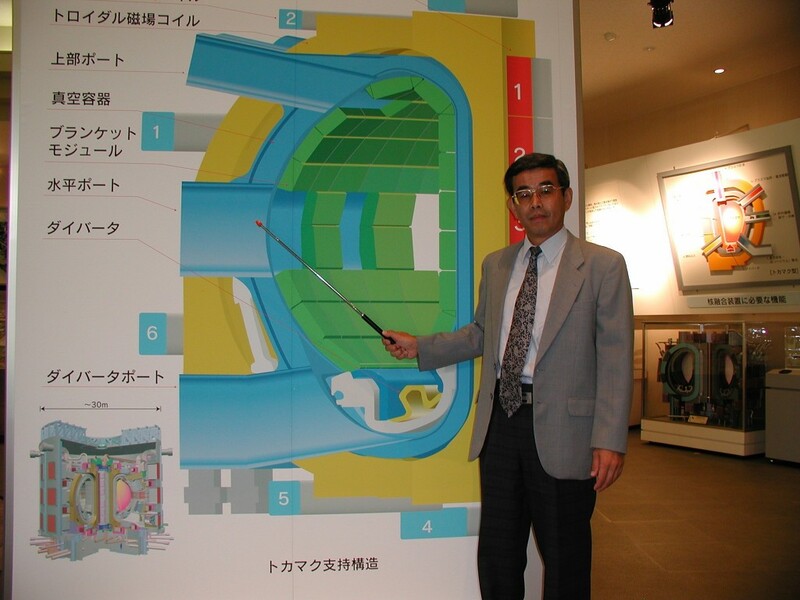 Takatsu-san joined the ITER Project in 1988 in the early days of the Conceptual Design Activities (CDA) phase. As a member of the Joint Central Team based in Garching, Germany he was in charge of the nuclear system and later, throughout the Engineering Design Activities (EDA), he became the deputy leader of the Japanese Home Team. From 1995 on, he supervised the Blanket Technology Laboratory in charge of both the design and technology development for the ITER shielding blanket and the Test Blanket Module (TBM). He was also a member of the ITER Test Blanket Working Group (TBWG) during the EDA phase. From 1998 until 2001 he served as a Contact Person on behalf of the Japanese government for the ITER Project. As ITER completed the EDA phase, he took over the supervision of all of the fusion technology R&D activities for ITER and DEMO as Director of the Fusion Technology Department of JAERI and later for JAEA. Takatsu-san was also Chair of the International Energy Agency (IEA) Executive Committee on Fusion Nuclear Technology Collaboration and is now Vice Chair of the Fusion Power Coordinating Committee. He is also acting Chair of the IFMIF/EVEDA Project Committee doing material research for future fusion power plants as part of the Broader Approach projects. Takatsu's appointment as JADA Head will be formally announced during the ITER Council meeting in Naka, Japan, next week. His new position will become effective from 17 June. Tsunematsu-san, who was acting Domestic Agency Head up until now, will remain Director-General of the Fusion Research and Development Directorates within the JAEA. "It is my real pleasure to come back to the ITER Project, which leads the activities of the worldwide fusion community. From my university days on, I fully devoted my research career to fusion. I enjoyed working on a large part of the lifecycle of JT-60, and when I joined the ITER Project, I expected to see another fusion device through its construction phase. Unfortunately, it took a long time to reach the point we are at now. I will do my best to contribute my knowledge and wisdom as much as I can towards the success of this project. It is a great pleasure to work again with so many of my old friends as well as to meet new friends." "In my view, ITER is a real challenge, not only from a scientific and technological point of view, but also from the point of view of management and organization. The new geometry of work sharing and work integration between the central ITER Organization and the seven Domestic Agencies is very challenging. Mutual understanding is central to this form of collaboration." "I know that the ITER Organization and the Domestic Agencies are working to perfect their collaboration to better manage technical, managerial, and financial concerns. I had the opportunity to participate in three ITER Organization-Domestic Agency meetings in the last two months where I was impressed by the progress made. Technical integration led by Principal Deputy Director-General and supported by the Project Office is improving thanks to more efficient collaboration and good understanding. In my experience, international endeavors like this need a 'shake-down' period before reaching 'steady-state' operation; this was the case during the Conception (CDA) and Engineering (EDA) design phases of ITER. These 'shake-down' periods are not waste of time and resources, but a necessary step for the project to run at its full capacity. We are now in the construction phase and the stakes are higher than ever, however I am convinced that our project will shortly reach 'steady-state' operation."